The volcano is averaging nearing 1,000 earthquakes per day. 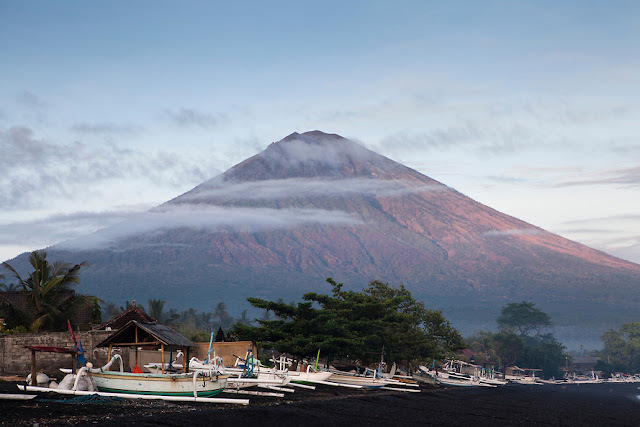 It was the big story of September, Mount Agung volcano on the tourist Island of Bali was about to blow and then seemed to fall off the radar as the reports stopped. The likelihood of an eruption of the volcano in the near future remains high. Seismic activity is unchanged at very elevated levels, with averages of around 8-900 earthquakes per day. Swarms of volcanic quakes likely reflect rock fracturing events by internal fluid pressure as magma intrudes the edifice at shallow depths. An increase in quakes occurred this evening (early morning in Bali) and can be seen on the seismogram. In addition, weak episodes of non-harmonic volcanic tremor have begun to occur during the past days as well; while it is not completely understood what causes the various types of volcanic tremor, the common interpretation is that internal movements of magma cause oscillations of the fluid and its conduits (in a similar way as passing air in organ pipes causes resonance). At the surface, the volcano remains, however, more or less calm. Only a small white steam plume can be seen rising from the crater. An attempt to survey the crater with a drone yesterday failed as the device crashed on its ascent. There are unconfirmed reports from people in the area who told in posts on Facebook and other media that animals have started to show unusual behaviour. How significant and reliable such reports are is questionable.